Dash away spatters with our premium button spats! 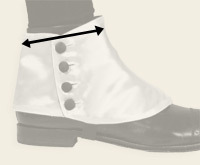 Our spats are the genuine article, with antique brass metal buttons, durable cotton lining, and sturdy cotton canvas body. Our four-button mens spatterdashes will protect your shoes, and your reputation, in any century. Imported. Body is an all cotton canvas fabric with a prominent wide stripe in off-white and navy blue, lining is all cotton. Dry cleaning recommended. Haven't worn them yet, but the look GREAT. If you get the pants and vest, go all the way and get the spats. Works with many styles of shoes and just sets the look right. Well constructed. Quality buttons. prompt delivery and good fit. I was happy to give this as a gift. This is the best kept secret place. I was brought in by a friend and my husband is so proud to wear his shirts. Thank you for your quick response to my order. Excellent all round, I did need a wee bit of tailoring on some of the items, but no problem at all.